This is a recipe that I give to all of my clients. It's a must have. It's easy. It's delicious. It's healthy. AND it's kid, husband, and boyfriend approved! I've even shown up at parties with this one. 😉 It's kind of like eating a salad, but everyone feels like they're having a pasta dish! I have never measured ingredients on this recipe as it’s always something I just “throw” together. It’s that easy! 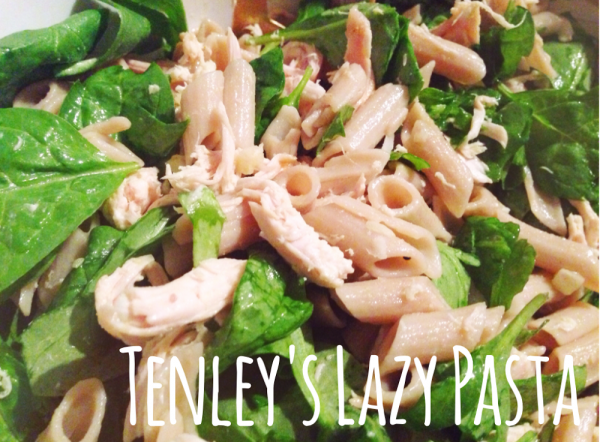 You can make a single serving of this lazy pasta dish for yourself or make a large serving for a whole family! Single Serving: Add a serving size of your cooked brown rice pasta to a bowl, add a couple cups of spinach, add your protein, and then dress with olive oil, garlic, himalayan pink salt, and your chili flakes if you choose to add “heat”. Feeding a Family or more than 1: Cook whole box of brown rice. Add cooked brown rice to a large serving bowl, add a whole bag or two of spinach to the bowl, add a couple servings of your protein. Drizzle with Olive Oil, sprinkle with Himalayan Pink Salt, add your garlic, and toss all together. I recommend keeping the Chili Flakes on the side, just in case someone in the group you are feeding isn’t a fan. Super easy and getting a complex carb, a immune fighter (garlic), Greens, a healthy fat (olive oil), Protein, and some good mineral balancing properties (Himalayan pink salt). Get even more creative with this dish and share with me some of your additions in the comments below! !